Happy Friday ladies... I hope you have big plans for this weekend! In the meantime, take some time to visit these inspiring posts from the blog world! thought and musing remixes one little black dress into three gorgeous outfits! You have to pop over and see her styling work. strong sense of style has you covered (literally) for the rainy spring weather. Check out her picks for rain jackets, wellies and umbrellas, oh my! a spoonful of dish manages to put together a fun blog post even when her internet is down - find out how she did it! I love a resourceful gal! good tots features a very chic nursery inspired by this gorgeous magenta dresser/changing table. So fun for a sweet baby girl! 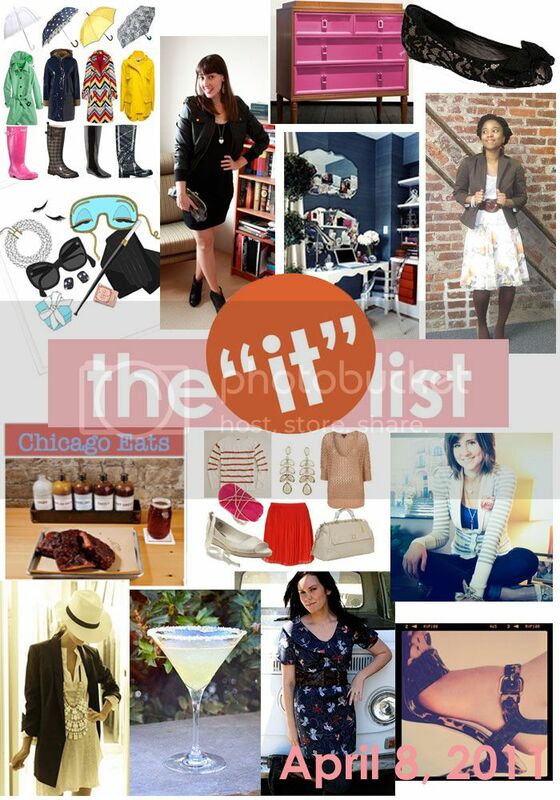 the IT list is compiled each week by Jill of good life for less - for more information, click here!